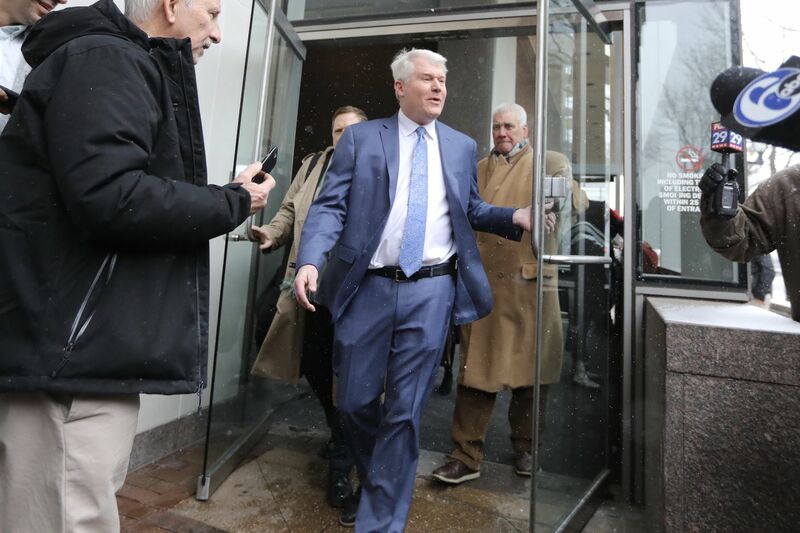 John "Johnny Doc” Dougherty leaves federal court after his arraignment Friday, February 1, 2019. Labor leader John J. Dougherty pleaded not guilty Friday to the sweeping federal indictment that accuses him of bribing a city councilman and enriching himself off the backs of union members. After a brief appearance before a magistrate judge in Philadelphia, the man known as “Johnny Doc” was released on a $50,000 recognizance bond after agreeing to limit his contact with potential witnesses — including those in his union — to work-related conversations. On the job site and behind the scenes, Johnny Doc shaped Philly’s skyline. Will he still? He had arrived hours earlier in a cobalt blue suit, and was unusually tight-lipped, saying only, “See you at 1:30,″ to the throng of reporters and cameras as he ducked into the building with his lawyer, Henry E. Hockeimer Jr.
As he left the building hours later, Dougherty, 58, told reporters he couldn’t answer their questions, but hinted he would have much more to say in the near future. “You’ll start to get all my personal feelings as all the factuals come out," he said before pushing through to a car waiting on Market Street. Dougherty was joined by two other indicted members of Local 98 of the International Brotherhood of Electrical Workers — political director Marita Crawford, 49, and employee Niko Rodriguez, 27 — in pleading not guilty Friday to counts including conspiracy, embezzlement, tax fraud, and theft before U.S. Magistrate Judge Elizabeth Hey. Anthony Massa, a 65-year-old Philadelphia-based contractor, also entered his plea and was released like the rest on a $50,000 recognizance bond. John "Johnny Doc” Dougherty leaves federal court after his arraignment Friday, Feb. 1, 2019. The proceedings were largely a formality, but it was Dougherty’s first public appearance since prosecutors unveiled the 116-count indictment in the case. The union boss’ house on Moyamensing Avenue in South Philadelphia remained dark for much of the day Wednesday, the day the charges were unsealed. More than two years earlier, though, when FBI and IRS agents searched the building, Dougherty stood outside holding court in a 76ers ball cap, an untucked white button-down shirt, and shorts, and nonchalantly served iced tea and doughnuts to reporters gathered outside. He repeatedly denied any wrongdoing that day, and has repeated that refrain as the investigation continued. Union spokesperson Frank Keel went further Friday, calling the government claims that Dougherty enriched himself on the backs of union members "a crock” and an attempt by prosecutors to turn Local 98′s membership against the man who has led them since 1993. “The membership has never been more strongly behind John ... and that’s not going to change,” he said as he stood outside the courthouse in the bitter cold to greet Dougherty’s codefendants as they arrived. >>BREAKING IT DOWN: Johnny Doc indictment: Who’s indicted and what are the charges? Brian J. McMonagle, the lawyer representing Philadelphia City Councilman Bobby Henon, also derided prosecutors’ allegations as an attack on organized labor a day earlier, after his client entered his own “not guilty” plea. Prosecutors allege Dougherty and other union officials drained Local 98 of more than $600,000 over six years to fix up their homes and pay for travel, groceries, and restaurant goods. They portrayed Henon as a puppet, swept into Council in 2011 with money from Dougherty’s union, then later used as a tool by the union boss to benefit his personal interests. In exchange, Dougherty allegedly showered Henon with benefits including tickets to Eagles games and a $73,131 annual union salary for what prosecutors described as a do-nothing job. Local 98 president Brian Burrows; Michael Neill, 52, the head of the union’s apprentice training program; and Brian Fiocca, 27, Dougherty’s nephew, are expected to surrender to authorities next week.